I’m at the CBC this week, so come by and say “hi” if you’re there. I’ll be in the Hach booth at the Brew EXPO. Most total package oxygen measurements are determined by the dissolved oxygen concentration in a shaken package. A straight shaken dissolved oxygen measurement can be a great part of your brewing quality toolkit, and it never hurts to have it. But it doesn’t reflect the oxygen in your headspace and its potential effect on your package. For that you need to calculate the TPO. Headspace oxygen concentration can actually be more than twice your dissolved concentration before shaking. So I thought I’d show an example of how much the TPO can vary on two packages with the same dO2, especially if their volumes are slightly different. Let’s start with two cans of beer, each with 100 ppb of dO2. (That means we’re looking at dO2 in the liquid only, before shaking.) The first has a 15 mL headspace due to a slightly high fill and the second has 25 mL because of a slightly low fill. While both packages have 100 ppb of dO2, the first has a TPO of 227 ppb and the second has a TPO of 312 ppb. For some this may be considered above their total package threshold. 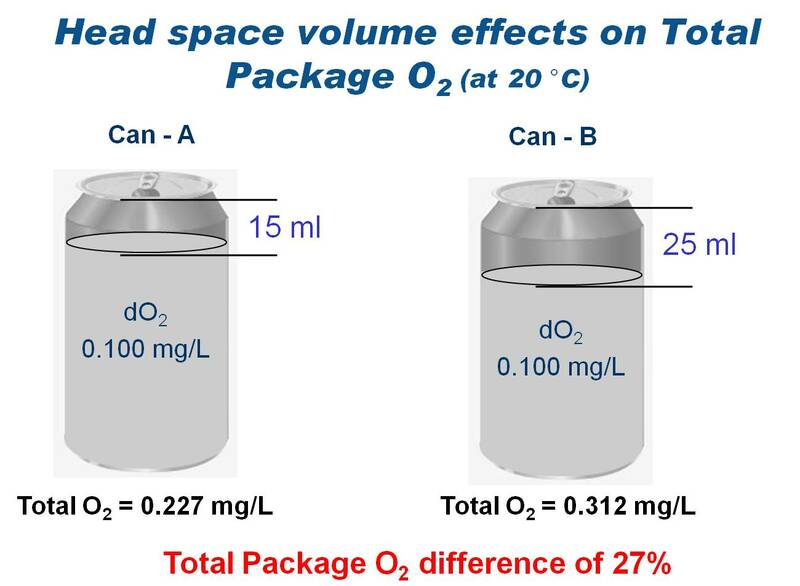 My final thought is that you should always consider the headspace volume when measuring dissolved oxygen in packages. You don’t need to know the exact TPO of every package, but by being aware that low fill measurements have less latitude than high fill measurements, you can help keep your package concentrations as low as possible. I’ve recently spent a few posts discussing measurement validation, mostly with a focus on situations where instruments were reading properly and there was a problem somewhere in the brewing process. Now I’d like to continue the discussion with an example of the reverse: the beer was actually okay, but sensors were in need of validation and calibration. We measured the beer in the fermenter with a second instrument that we could easily calibrate and validate, should the reading fall outside the expected range. Then we measured 99.999% N2 calibration gas on both instruments. Optical oxygen analyzers will drift upward over time due to photo bleaching of the fluorescent matrix. If instrument readings using calibration gas are above 3 to 5 ppb, then it’s probably time to calibrate the instrument. In this case we discovered that both instruments needed calibration. On the beer, one was reading 8 ppb and the other 30 ppb. On the calibration gas, the first instrument read 3.5 ppb and the second read 16 ppb. We didn’t proceed to calibrate right then, but knew that once they were calibrated they would agree. My final thought is to validate whenever a reading does not seem logical. In this case, the brewer was wondering if there was an issue with his fermentation, but it wasn’t his process, it was the need for instrument maintenance.